Plains Indians have the buffalo, mountain Indians have deer, coastal Indians have whales and fish. 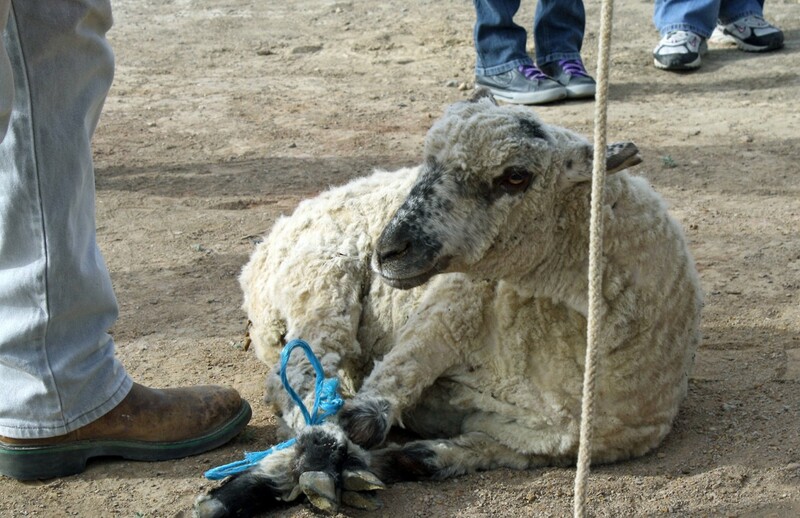 Navajos have the sheep. Actually we acquired them in the 17th century when the Spanish brought them close enough for Navajos to steal and trade for them. We quickly adopted them into our culture and way of life. Back then families had huge herds and they became a major commodity. They were eaten and their wool was used to make yarn and rugs. They’re still used this way, but on a much smaller scale and primarily for celebrations and special occasions. My family rarely butchers sheep. I have only seen part of it once, but never the whole thing. I said I was curious, so they recently got together and bought a sheep from a family friend. On my great-grandmother’s (Grace Tsosie, who is 85 years old) side, they butcher sheep all the time. We went to her house, about three miles west of Crownpoint, and butchered our first sheep together. It’s customary not to stress out the sheep, and the final deed is done quickly. I am a foodie. I love to eat and try new things. I enjoy being in restaurants and in the kitchen. So it’s safe to say food is a hobby and a passion of mine. I’ve eaten Korean, Ethiopian, Indian, Belgian, South American, German, Czech, Italian, Vietnamese, Thai, Afghan and Japanese food. Middle Eastern and Mexican foods are my favorite. But I’ve never really explored the food that comes from the Navajo reservation, where I’m from. On a recent trip home I got to experience a sheep butchering for the first time. Witnessing this with my family was a great experience. I didn’t take part, physically, because I was taking photos most of the time. Next time I’ll get in there. Kudos to the Miss Navajo contestants. They butcher sheep by themselves in front of an audience and judges while wearing a full dress and jewelry. Navajo food doesn’t only come from the sheep. Historically Navajos hunted rabbits, deer, prairie dogs and elk. Navajos also grew corn, squash and beans. Our neighbors had a huge influence on our food too. From the Mexicans and Spanish we have Navajo tacos, pesolé and chile stews. Oh, and tortillas – every Navajo woman must know how to make fry bread and tortillas. We also consider tamales to be a delicacy, just like the Mexicans do, and they’re only made for special occasions. A lot of our Navajo words for foods are actually Spanish words too. Geeso is how we say “cheese;” queso is how it’s said in Spanish, and it sounds the same. Mandagi’a is Navajo for “butter,” which is mantaquella in Spanish. There is a wider variety of traditional Navajo foods including blue corn mush; ground blue corn cooked in hot water and salted or served with sugar; Navajo tea, which, to me, tastes like you took a fall in the weeds and got some of it in your mouth; and Navajo cake, a mix of ground corn and other sweet things that is baked underground and comes out dense and kind of tough – for a cake. But back to the sheep. Scroll through the photo gallery below to see photos of the butchering I experienced. My great-grandma and her son Willie Murphy, my grandpa, worked together on the sheep. They spoke Navajo to each other. Here, the sheep has died and has bled out. (We saved the blood for blood sausage, which is a mix of the blood, potatoes, chile and sometimes some corn meal. This is boiled in the sheep’s stomach and it turns out dense and sausage-like.) In this photo, they are removing the skin. This is on my great-grandma’s front porch, by the way. Butchering a sheep is a job for everyone. Even the little kids get involved and learn not be scared or grossed out by this. They know the end result is going to be delicious. My young cousin holds a sheep leg, while her brother and sister watch in the background. My dad, Tim, is in the blue shirt and my sister, Lisha, is in the “Albuquerque” shirt. You don’t wear your Sunday best when you do this. When the skin is removed, the sheep is hung in the air for the butchers to remove the insides and start taking it apart by the ribs, backbones and limbs. My great-grandma has a few dogs that kept close eye on what we were doing. So we hung the meat up high to allow it to completely die and stop twitching before we packed it away. I didn’t know that fresh meat like this could sit around for a few days. We were told not to eat it right away and that it tastes better if you let it sit for a day or two — not in the refrigerator. Some of my great-grandma’s favorite parts are the insides. Certain parts of the sheep are given to the butchers and certain parts are given to the dogs. My young cousin listens to my great-grandma talk about the intestines she’s holding. Cleaning the intestines is hard and dirty work. This sheep must have had a feast the night before. My mom, Kathy, is up front cleaning the small intestines, which we used to make ach'íí – grilled small intestines wrapped around a thin strip of fat. My grandma, Oleta Murphy, in the black shirt, is cleaning more intestines. The liver, intestines, stomach and other bits are ready for cooking. My sister loves this stuff when it’s all chopped together and fried with some potatoes and squash. I think she ate most of it when we took it home. I, on the other hand, had lost my appetite. For one, my family and I were out until 4 a.m. to watch my dad’s country western band, The Outlaws, perform in Gallup. We butchered at 8 a.m. the same morning. By the time butchering was finished, we were exhausted and I lost my appetite. I didn’t want to eat this bowl of fried guts or the mutton. But even when my appetite came back, I still didn’t like this. I couldn’t bring myself to take another bite of stomach or liver. It had an overwhelming grassy and poopie flavor. Maybe my palate has changed, because I remember eating this stuff long time ago and I liked it. I especially liked the intestines. I was kind of upset with myself this time because I thought I would have enjoyed the insides, but I just couldn’t. When my sister, my cousins and I were small, we used to play and run around my great-grandma’s place. There were always sheep skins hanging and drying on this tree. It’s still full of sheep skins and they’re even “growing” in the ground. I used to be really scared of this tree back then. When I saw it again, it reminded me how fun it was as a child. I used to love to run and race everyone. I was fast. At home, my dad prepares the sheep head by burning and scraping off the hair. Sadly, we forgot all about the sheep head in the oven and we never ate it. There was so much mutton everywhere that we couldn’t keep track of it! Usually you can eat everything: eyes, cheeks, tongue, brains, etc. I’ve never had this experience, but I do imagine the cheeks are tasty. Indian Country Today ran a great story this week about Dr. Lori Arviso Alvord, the first board-certified Navajo female surgeon, who has just been nominated to serve as U.S. Surgeon General.